Guys, before we get this party started, I have some exciting news -- the official Hummingbird on High twitter account is up and running! Follow the account for new blog posts, recipe tips and tricks, Instagram photos, and all things blog related. ... and back to the cupcakes. 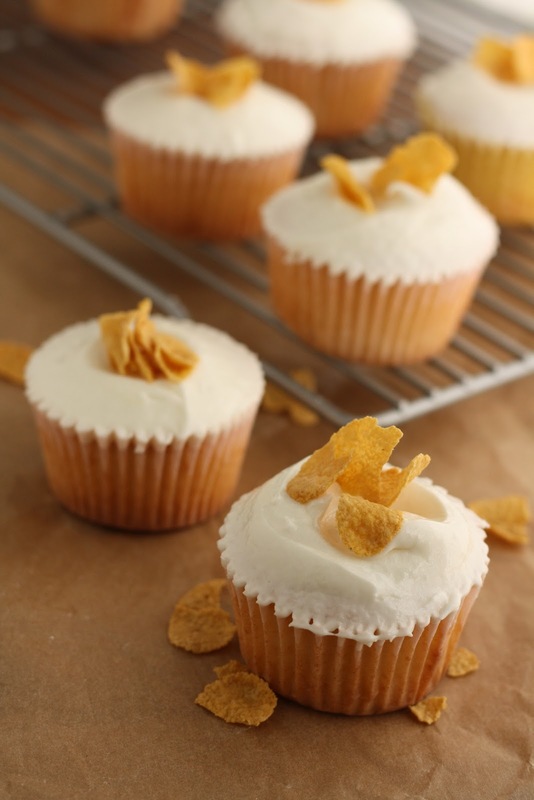 According to the Momofuku Milk Bar Cookbook, cereal milk is the bakery's most popular item and is what the bakery is best known for. Cereal milk is exactly what it sounds like -- milk infused with cereal flavor, created by steeping and seasoning the milk with toasted cereal. You know how when you eat a bowl of sugary breakfast cereal in the morning, the leftover milk has been sweetened by your pile of cereal? Yep. This is basically what cereal milk is. Christina Tosi, executive pastry chef of Momofuku Milk Bar and winner of this year's James Beard's Rising Star Chef award, actually sells this stuff for $5 a bottle. She's even trademarked it too. She describes cereal milk's origins in the Momofuku Milk Bar Cookbook as having come from a struggle to bake an original flavor for panna cotta. Which got the wheels in my head spinning. 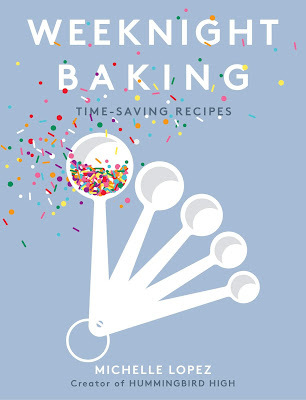 The cookbook talks about all the other things you can use cereal milk for: you can drink it straight, use it in an ice cream base, pour it into your coffee... but what about using it in baked goods? Specifically, how about using it in the one baked good that Momofuku Milk Bar doesn't specialize in? 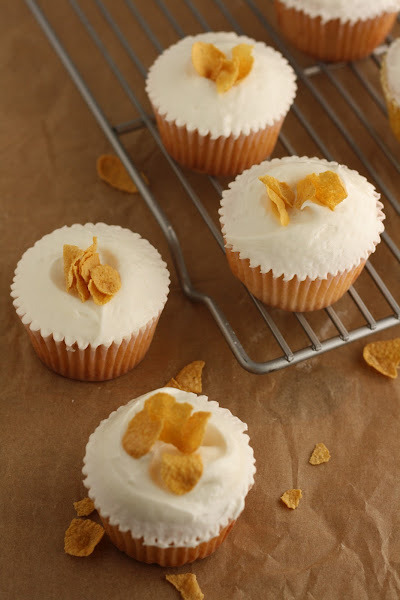 These cupcakes are made from the Hummingbird Bakery Cookbook's recipe for vanilla cupcakes, but with a twist. Instead of using the regular whole milk that the original recipe calls for, I used some homemade Momofuku Milk Bar Cereal Milk made from the Momofuku Milk Bar Cookbook. The result was interesting. 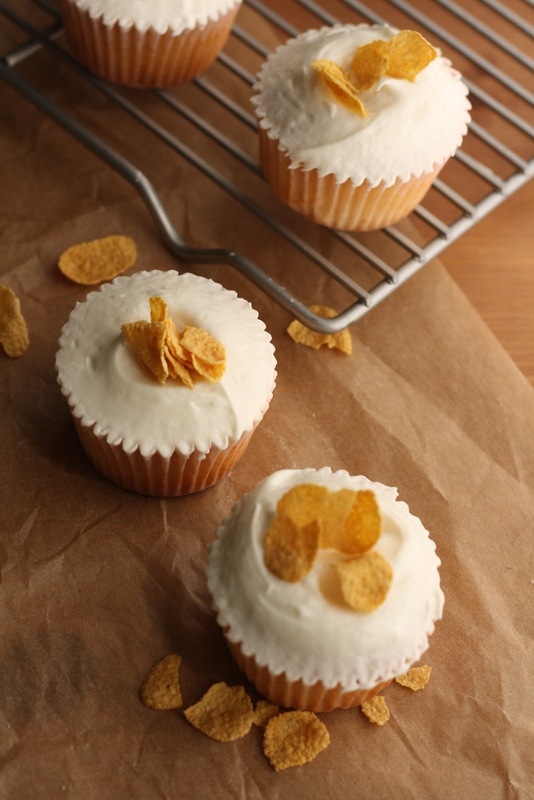 The cereal milk added a unique and almost salty flavor that complemented the Hummingbird Bakery's vanilla cupcake recipe very well. 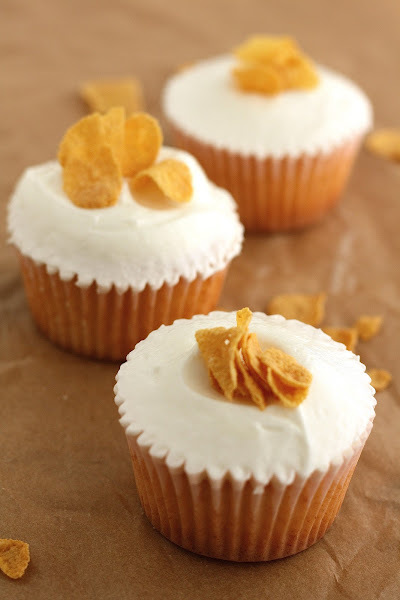 My boyfriend said that the cupcakes reminded him of sweet cornbread. Another friend said they tasted exactly like the leftover milk at the bottom of a finished bowl of cereal. All I know is that I personally couldn't stop licking the spatula from the frosting bowl. Heat the oven to 300 (F). Spread 2 3/4 cups cornflakes on a parchment-lined sheet pan. Bake for 15 minutes, until lightly toasted. Cool completely. Transfer the cooled cornflakes to a large pitcher. Pour the 3 3/4 cups milk into the pitcher and stir vigorously. Let steep for 20 minutes at room temperature. Strain the mixture through a fine-mesh sieve, collecting the milk in a medium bowl. The milk will drain off quickly at first, then become thicker and starchy toward the end of the straining process. Using the back of a ladle, wring the milk out of the cornflakes, but do not force the mushy cornflakes through the sieve. Whisk 2 tablespoons light brown sugar and 1/4 teaspoon salt into the milk until fully dissolved. Store in a clean pitcher or glass milk jug, refrigerated, for up to 1 week. 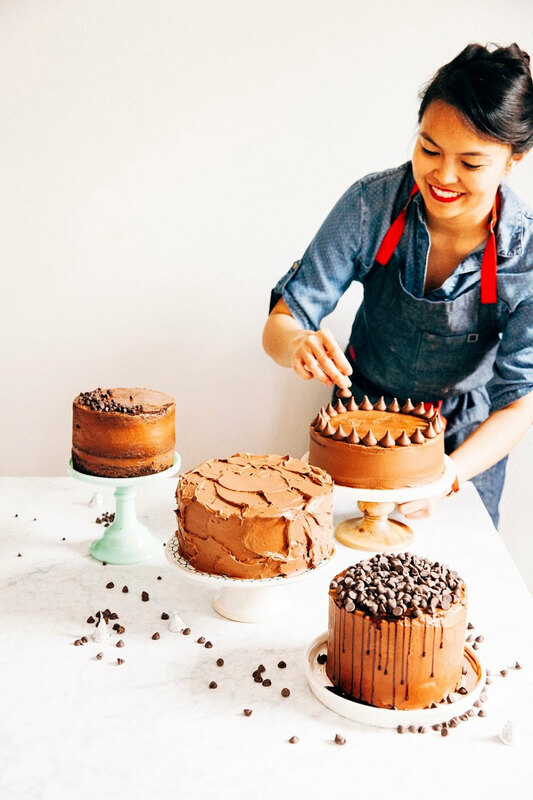 Put 1 cup flour, 3/4 cup sugar, 1 1/2 teaspoons baking powder, 3 tablespoons unsalted butter, and a pinch of salt in a freestanding electric mixer with a paddle attachment (or use a handheld whisk) and beat on slow speed until you get a sandy consistency and everything is combined. Divide the 1/2 cup cereal milk into two 1/4-cups. Pour in 1/4 cup into the flour mixture, and beat until the milk is just incorporated. Whisk 1 egg, 1/4 teaspoon vanilla, and remaining 1/4 cup cereal milk together in a separate bowl for a few seconds, before pouring into the flour mixture. Continue beating until just incorporated, scraping any unmixed ingredients from the side of the bowl with a rubber spatula. Continue mixing for a couple more minutes until the batter is smooth, but do not overmix. 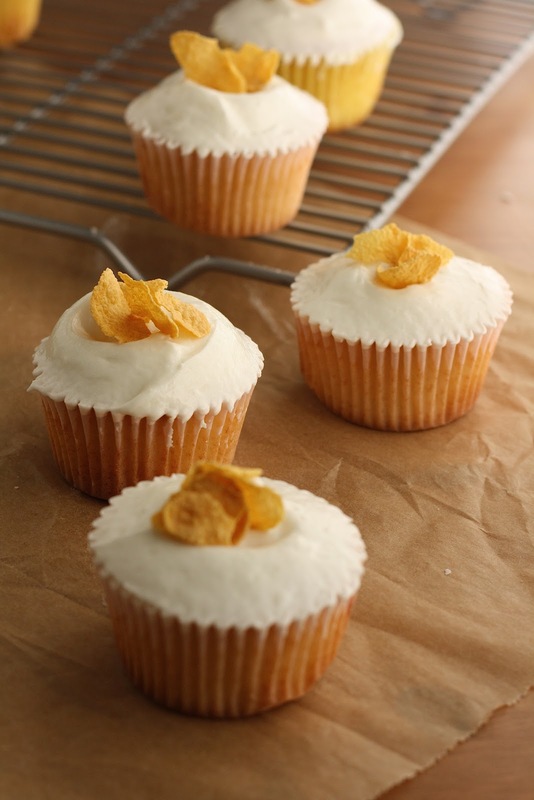 Spoon the batter into paper cases until two-thirds full and bake in the preheated oven for 20-25 minutes, or until the cupcake tops are light golden and bounce back when touched. A skewer in the center should come out clean. Let the cupcakes cool slightly in the pan before turning out into a wire rack to cool completely. 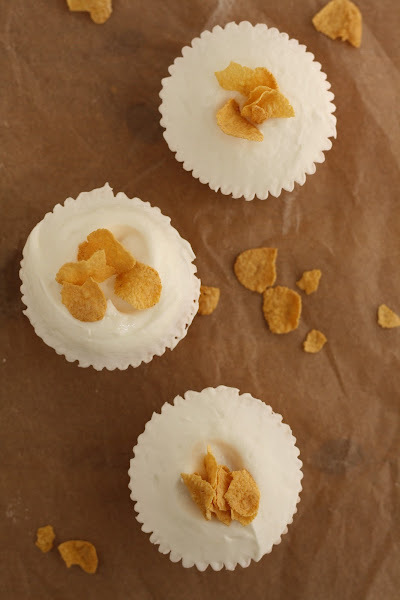 When the cupcakes are cold, spoon the Cereal Milk Frosting (recipe follows) on top and decorate accordingly. Beat 2 cups confectioners' sugar and 5 tablespoons butter together in a freestanding electric mixer with a paddle attachment on medium-slow speed until the mixture comes together and is well mixed. Turn the mixer down to a slower speed, and add 2 tablespoons cereal milk into the butter mixture a couple teaspoons at a time. Once all the milk has been incorporated, turn the mixer up to high speed. 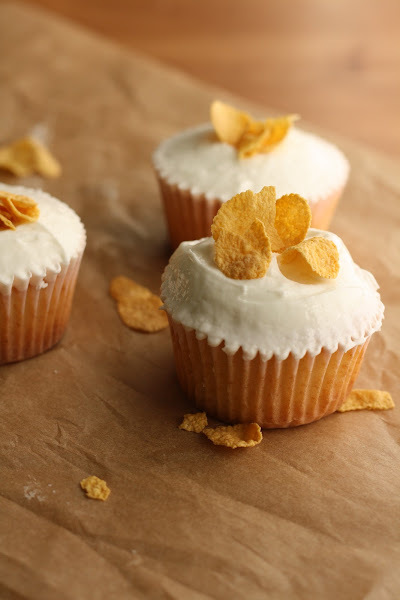 The recipe for Cereal Milk makes more than what's needed for the cupcakes. Simply cut the recipe in half if you're looking to avoid excess. If you're pressed for time, you can skip toasting the cornflakes in the oven, but toasting the cornflakes before steeping them deepens the flavor of the milk. Taste your cereal milk after you make it. If you want it a little sweeter, add a little more brown sugar (but it was plenty sweet for me!). If you want a more mellow cereal milk, add a splash of fresh milk and a pinch of salt. The cereal milk's flavor will affect how salty/sweet your cupcakes will be. After adding the milk and eggs to the flour mixture, don't overbeat as this will overwork the flour and make the cake dense -- simply beat until the milk and eggs have just been incorporated. Specifically for the Cereal Milk Frosting: the longer you beat the frosting, the fluffier and lighter it becomes. I recommend a beating time minimum of at least 5 minutes. what a scrumptious, fantastically brilliant recipe! Aww, gee shucks. Thanks so much! would love to make this by wednesday! do you think it will still taste okay if i don't let the milk soak for a week? ?